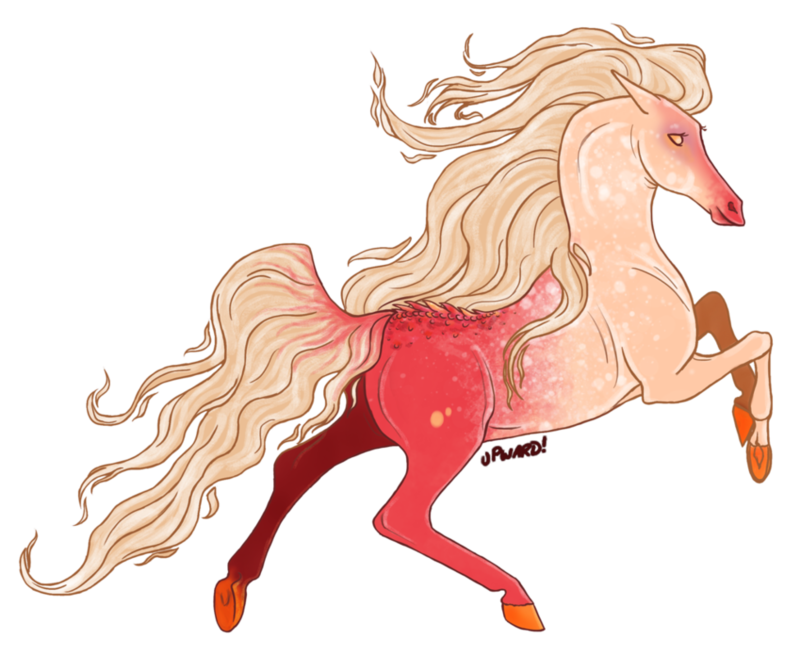 Dressed in decadent colouring, Nausicaa is a shining character from ears to hooves. She sparkles with a sense of tranquillity, matching the twinkling of the sea by reflecting the light that bounces on her body. Various shades of pink make up her light form, from the deep depths of cerise to the surface of peach. What is a constant across her is the speckles of white, seemingly blending the two halves of her together. When in her hippocampus form, Nausicaa boasts gorgeous betta fish type fins on her chin, dorsal stripe and back end. This only ever happens when she touches water as a pure liquid (ice and steam have little effect on her), and she can often find herself compromised in rain, thus leading to her sticking underwater during storms. Nausicaa is creative with her hair, often adding the remnants of the ocean to it in imaginative new ways. One day, perhaps it will be held up with a seashell; the next, it may be decorated with complex plaits that she has to get assistance from her familiar to do. Her tail is just as long as her hair, but she spends less time over it as it is more often a fin than hair. Pale eyes sit neatly on her fine features, delicately assessing the world around her. Usually smiling, Nausicaa has an aura of happiness around her that seems to make her whole body glow with life. The happiest of souls, Nausicaa observes the world through rose tinted glasses. Almost always positive, she skips through life humming a cheerful tune and always looking on the bright side of things. This nature is equally matched by her innocence; naive and a little ditsy, she sometimes can cause more chaos than she intends by being too helpful and overstepping the mark. Often coupled with a sheepish, apologetic look, Nausicaa tries hard to make everyone else be as joyous as she is... but sometimes a little too hard. Gregarious in nature, if perhaps too friendly and open, she longs to make friends with anyone and everyone. This leaves her exposed to being easily led astray, as her loyalty is second to none. Those who take advantage of her find themselves being disappointed in rather than anger, as the latter seems to be an emotion that Nausicaa finds very difficult to grasp. She doesn't quite understand her femininity yet, and struggles to flirt successfully, though she believes she knows what love is; whether or not she truly knows what it means to love someone is another debate entirely. Bouncy but respectful, she is well-mannered and always remembers to look up to her elders -- this helps her a lot because she absorbs advice from them and takes it as gospel truth. In all, she is kind and bubbly, putting others before herself. Though she can land herself in hot water by being too outgoing, her heart remains in the right place. Perhaps with age she will grow colder and begin to understand that the world is not all sunshine and rainbows, but for now, she gazes on the world with soft eyes and a constant smile that would annoy even the most patient of horses! Nausicaa's happy nature seems to have appeared from no where, as her childhood certainly does not explain it. Raised with a strong affiliation to the sea, Nausicaa's father was a pirate and her mother was a prostitute who died only a year after her birth. When her father returned home, she quickly had to take on the role of the woman around the house, preparing meals and keeping things clean. Her lack of a childhood made her develop quickly, and she almost seems to be living it now, later on in her life away from the controlling nature of her father. She has one younger half-sibling whom she knows very little about, except that they sail on board her father's ship. When she was two years old, she left her homeland (known as Fairwater Harbour) and found herself in a nunnery. She committed her days to prayer to a sea goddess known as Aedre-Lyn, but when her closest companion, the gardener Ulysses, died, she found herself no longer believing in a higher power. Leaving the nunnery behind, she has firmly put the past in the past and now walks around with her head held high and a smile playing across her lips. Though it takes considerable effort, Nausicaa possesses water magic, which she learnt that she had when walking the golden beaches of her home city. Nausicaa is able to manipulate already existing water droplets, for example, rain. This means she can create an invisible "umbrella" type magic, where no water falls on her. This only lasts for ten minutes, however, giving her enough time to find shelter before she turns into her hippocampus form. After using her magic to move droplets of water, she cannot do so again for another two hours, and also is exhausted and has to rest. In the future she hopes to focus her magic enough so she can manipulate larger bodies of water and also produce the water using moisture in the air. Nausicaa can now last for a whole half an hour keeping water at bay from her body. This is especially useful to get out of the rain! It still takes two hours for her to get her magic levels back up again. At this level, Nausicaa can now produce water droplets from the air. With the ability to manipulate water from nothing comes exhaustion, and she can only produce small droplets for about twenty minutes. In its final level, Nausicaa will be able to produce a type of 'bubble' made of water that, in the event that she turns into a hippocampus on land, she can float in the air to some place dry and wait to turn back into a horse. Nausicaa's familiar is named Telemakos, and he is an albatross. She was gifted the albatross egg by Ulysses, the gardener at the nunnery she stayed at, and her first real love. Watching over it made her feel like she had a purpose, and she named him Telemakos when he was born. They have been inseparable ever since, with Telemakos helping her with things such as her hair and scouting out places to shelter if there is an incoming storm. 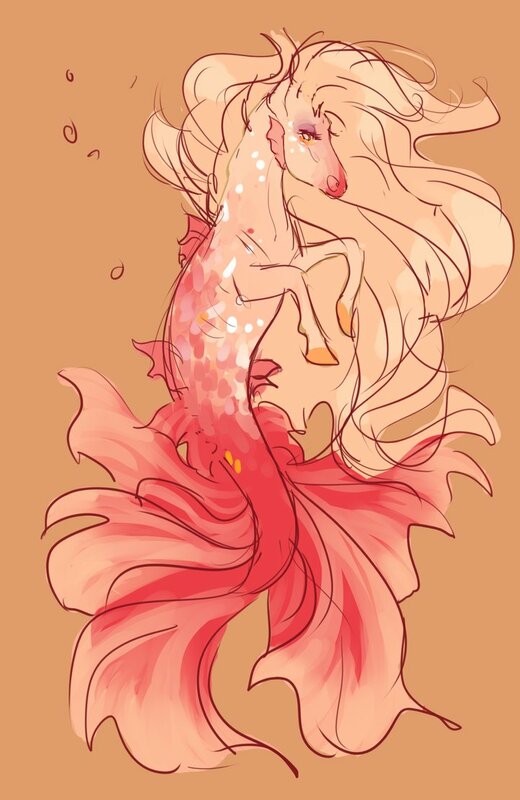 When she is in water in her hippocampus form, he happily floats around on the surface waiting for her return.